SCOTTDALE, PA – January 17, 2017 – WeddingWire, the leading global online marketplace for the wedding and event industry, announced Carson’s Premier Catering as a winner of the esteemed 2017 WeddingWire Couples’ Choice Awards® for Catering Services in Scottdale, PA! The WeddingWire Couples’ Choice Awards winners are determined solely based on reviews from real newlyweds and their experiences working with Carson’s Premier Catering. Award-winning vendors are distinguished for the quality, quantity, consistency and timeliness of the reviews they have received from their past clients. As a Couples’ Choice Awards® winner, Carson’s Premier Catering is highlighted on WeddingWire, which is comprised of more than 200,000 wedding professionals in the U.S.
Carson’s Premier Catering is thrilled to be one of the top Catering Services in Scottdale, PA on WeddingWire. We would like to thank our past clients for taking the time to review our business on WeddingWire. We truly value all of our clients and appreciate the positive feedback that helped us earn a 2017 WeddingWire Couples’ Choice Award. For more information about Carson’s Premier Catering, please visit our WeddingWire Storefront today at http://www.weddingwire.com/carsonspremiercatering. Carson’s Catering is excited to share the holiday season with our customers to help them create new memories with family, co-workers, and friends. We have a lot of events going on in December, and we’d love for you to join us at our restaurant or order a delicious catered meal. Santa is making special appearances at Carson’s! On December 18, 2016, we are hosting Brunch with Santa from 11 a.m. – 1 p.m. Bring your kids, grandkids, friend’s kids . . . anyone who would love to meet jolly old St. Nick! A photo with Santa is included with your brunch. During this time of year, we work with many companies in the area to provide catered lunches and dinners for holiday and Christmas parties. Our holiday menus range from elaborate, sit-down dinners to a more simple hors D’oeuvres and dessert menu. If you’d like us to cater your holiday party, give us a call. Our buffets offer choices for every taste, and we will work with you to create a buffet menu everyone will love. Catering for home is available, too. Leave the meals to us, and enjoy your party or event. Don’t forget that Carson’s Premier Restaurant has a Friday Night Seafood Buffet with all of your favorites: Canadian Crab Legs, Shrimp, Clam Chowder, and much more. Stop in on Saturday nights for our Delallo Italian Buffet, featuring a variety of savory dishes, like Chicken Parmesan and Meatballs, plus our Made-to-Order Pasta Station, and even dessert! Carson’s is hosting a toy drive with Toys For Tots! For each new, unwrapped toy donated by December 11, 2016, at Carson’s Premier Restaurant, you’ll receive one $5 gift certificate to use at the restaurant at any time from now until March 31, 2017. You’ll be helping us help the kids in our community have a great Christmas, and we appreciate your generosity. 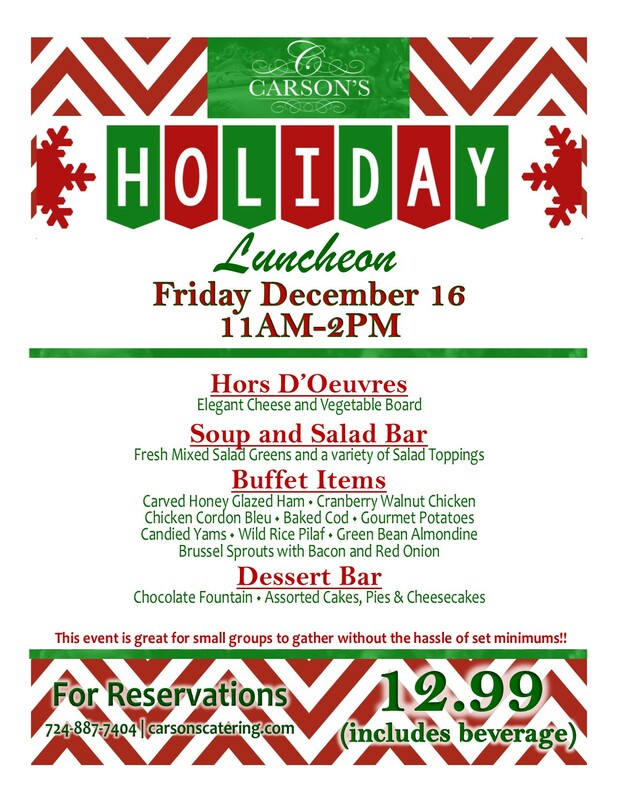 Our Annual Holiday Luncheon is being held on Friday, Dec. 16 from 11 a.m. – 2 p.m. This event is great for small groups to enjoy time together—and there are no set minimums. The menu includes hors D’oeuvres, a soup and salad bar, and a dessert bar. Some of our buffet items served will be Carved Honey Glazed Ham, Cranberry Walnut Chicken, Baked Cod, and many other selections. Call for your group’s reservations today. Need a gift idea? How about great food? We are offering a fantastic deal: for every $25 in gift cards that you purchase, you’ll receive a free $5 gift card at Carson’s Premier Restaurant. Don’t forget everyone on your shopping list: your hair dresser, your child’s teacher, your parents, your neighbors—anyone who loves food (and that’s everybody!). Carson’s Premier Restaurant offers a holiday buffet for New Year’s Eve, so you don’t have to cook. A December 31st holiday celebration, followed by a fun night out, can be just the thing for families, friends, or neighbors. You’ll love the menu we’ve cooked up for this event. It’s from 5-9 p.m. and although reservations aren’t required, you’re welcome to make them. The holidays are quickly approaching, which means that Carson’s Catering will be welcoming a very busy season as we help the folks around our area celebrate. We’ll handle the cooking, and you’ll get time to finish your decorating, holiday shopping, and all of the other things you’ll need to do before Christmas is here. Call Carson’s Catering today to schedule a great, catered meal, or come by the restaurant for a night out. Greensburg, PA – Carson’s Catering, the premier catering and event planning company in Westmoreland County, is pleased to announce the opening of Waterworks, Greensburg’s newest wedding and banquet facility. The Waterworks complex includes several event areas, including a banquet room, meeting room, and private party room, as well as an on-site restaurant. Tim and Kristine Carson, the new owners of Waterworks Event Center, purchased this former water treatment plant and created Westmoreland County’s most beautiful banquet and gathering space. Weddings. Waterworks weddings and receptions are beautiful, elegant affairs that are tailored to the vision of the bride and groom. The Cascade banquet room, sitting up to 220 people, boasts cathedral-style ceilings, exposed wooden beams, chandeliers, and large windows that invite views of an outdoor courtyard. Waterworks’ on-site catering with custom menus will deliver an unforgettable dining experience for couples and their guests as they celebrate their wedding day. An outdoor ceremony space and courtyard is also available. The event staff offers full service wedding coordination that includes set-up, decorating and dining. Event Spaces. In addition to the Cascade banquet room, Waterworks provides event spaces for special occasions, business events, and private parties. The Deep End has a full bar and is perfect for events up to 60 people, while the Creekside conference room offers a relaxed space for meetings. The Pumphouse Pub. This restaurant and lounge launched a new menu in June that features a large selection of dinners, Greensburg’s best sandwiches, and a soup and salad bar. There’s outdoor dining, live music, DJs, and dancing, and guests can relax by playing a game of pool or darts while enjoying time with friends. The wedding, banquet, and all-occasion menus include favorites for both buffets and sit-down meals. “Waterworks shows just how committed we are to the Westmoreland Country community. This is a banquet center that everyone can enjoy. Since we’ve opened our doors, we’ve welcomed dozens of weddings, receptions, and parties. Not only is this space picture perfect, the food is fabulous –it’s exactly what everyone expects from Carson’s Catering,” said Tim Carson, CEO of Waterworks and Carson’s Catering. “Tim and I wanted to create an elegant, upscale wedding venue, but we also planned a comfortable place for events and dining. The Pumphouse Pub Restaurant and lounge has become a Greensburg favorite. It features a new menu of favorites, offers entertainment, and is also kid-friendly. This is the kind of venue that everyone visits to enjoy a great meal and spend time with friends and family,” said Kristine Carson, President of Waterworks and Carson’s Catering. Waterworks’ new, fully responsive website is now live. Designed by Pittsburgh digital media firm Higher Images, it showcases the wedding venue, includes menu options for all events, and features an availability calendar so users can look for open dates. Reservations can be made by contacting Waterworks at (724) 216-5408, emailing info@waterworksgbg.com, or visiting in person during operating hours. Carson’s Catering, located in Scottdale, PA, has unveiled a rebranding by introducing a feature-rich website, updated logo, and an enhanced social media platform. The new, easy-to-navigate website at http://www.carsonscatering.com/ features Carson’s catering, restaurant, and wedding services. Menus, wedding venue images and descriptions, and testimonials from many satisfied customers are available to view. Carson’s also is the exclusive caterer for five high-end venues in the Westmoreland-Fayette corridor, as well as a preferred caterer for more than 20 other locations, including upscale sites such as Fallingwater. Brides and grooms from all over western and central Pennsylvania book Carson’s venues, and the company handles every wedding reception detail, including the menu, service, and bartending. “Our new website showcases Carson’s different services, including our wedding packages, catering, and restaurant. Our website is also mobile-friendly, which means that you can contact us while you’re on the go. We’re excited to be serving our customers this way, and we look forward to connecting through social media too,” said Tim Carson, CEO. “We’re proud of our commitment to the community, and we believe that this rebranding matches the level of service we provide for events. Our new website and social media strategy will help us gain more customers while keeping the great food and excellent customer service our current customers love,” said Carson. As the Mon Valley’s premier catering company for the Laurel Highlands and Monongahela area, Carson’s wedding, restaurant, and catering services provide quality food, great service, and no-worry weddings. For more information about their services, visit their new site at http://carsonscatering.com/.